As the semester is coming to a close and finals are coming up, I’m sure many of you are simply focused on making it through the next couple of weeks alive (I know I am). Never fear, Glossers! I’ve put together a list of things to put in your “Finals Survival Box” to make the next couple of weeks much more bearable. 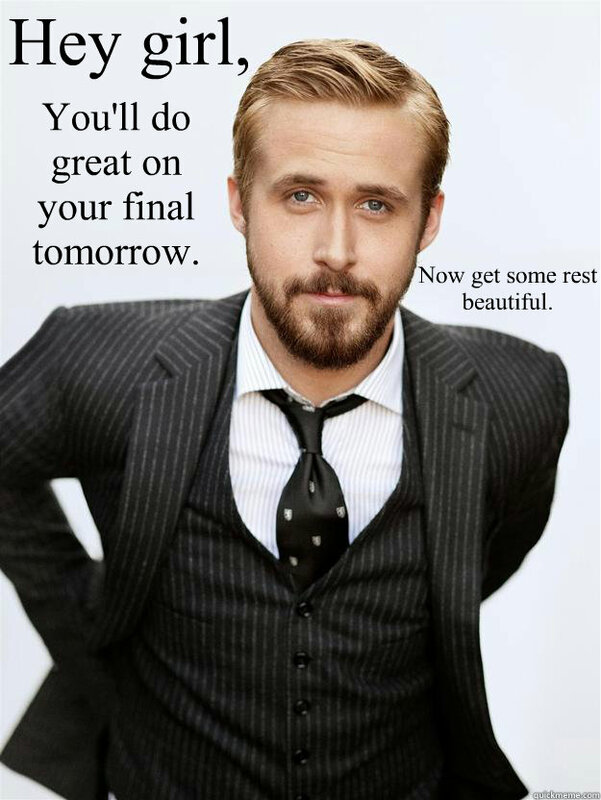 If Ryan Gosling telling you to study and reminding you that it’s okay to wear yoga pants during finals weeks doesn’t make you feel better, I’m not sure I can help you. Print off these pictures and put them on everything— your walls, desk, binders, you name it! For only $9, you can take a single yoga class at the Rec center. They offer several types of yoga and at various times throughout the week. Grab a friend or go by yourself for some much needed R&R. Bust out some crayons, colored pencils, or markers and color a picture. Coloring is a quick and easy way to reduce stress and give your brain some time to unwind. There are several websites where you can print out pictures for free. My favorite kinds of pictures to color are mandalas and Disney pictures. Chewing a certain kind of gum while studying and chewing the same type of gum during your final can help you remember more information. The flavor of the gum will trigger the memory of studying, making the information you studied that much easier to remember. Keeping your brain and body hydrated is also extremely important during finals week. If your brain is dehydrated, it will not perform as well. I have a theory that bright lipstick, especially red lipstick, has the power to instantly brighten anyone’s mood. There’s just something about lipstick that makes you feel more put together and happy. Revlon’s new line of lip butters come in wonderful shades and won’t dry out your lips or break the bank. 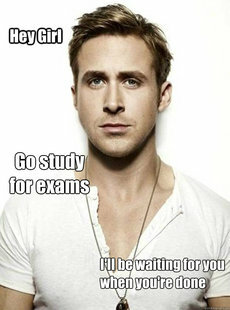 Start making a study plan for each final right away! The earlier you start, the more you can actually sleep finals week. I know Netflix is calling your name, but think of it this way: The more you get done now, the more time you can spend on Netflix in between your exams! When making your study plans, work backwards from your exam date and make sure to break everything into small chunks, ie., one chapter a day. Keep your study plans posted on your desk as a little reminder that you CAN do this and that finals are closer than you think. This free app has saved my life many a time. You can download it on your phone and laptop to keep all of your to-do lists synched. You can create different lists for classes, work, activities, etc; look at just today’s tasks (from all of your lists); create repeating events and more. The fact that my to-do list can constantly be updated between my laptop and phone is my favorite part, since I often had this problem with other apps. For every hour of studying, pop a piece of Dove chocolate, read the wrapper, and take a couple minutes to yourself. If you don’t like chocolate, use stickers or another form of motivation. Do what works for you, Glossers! When you’re stressed out, you may want to eat all of the junk food in sight and stay far away from the gym, but that’s the last thing you should be doing. Try to eat healthy, squeeze in a little bit of exercise and sleep —it will do you and your brain a world of good! When finals roll around, show up to your exams looking nice. Studies have shown that when you dress nicer, your posture improves and you’re able to focus on the exam better. I’ve always followed this tip and have actually noticed that how I dress impacts how well I do on an exam. It only takes a few extra minutes to slip into a cute dress instead of gym shorts and a T-shirt, and it can majorly boost your mood and even your grade! Good luck with your finals, Glossers! I wish you all the best and hope these tips help you survive the next few weeks. Hang in there because the end is in sight!